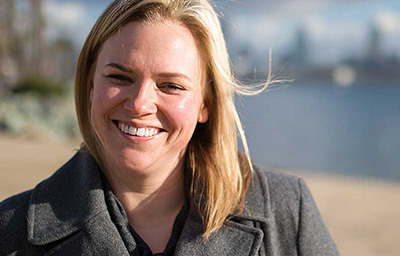 Trying to cut down on your carbohydrate intake for blood sugar control? HealthCentral compiled a collection of diabetes-friendly recipes that are short on carbs but big on flavor. This simple but delicious low-carb main dish can be cooked in the oven or grilled outdoors. Serve with vegetables or salad on the side to create a healthy meal. In a large bowl, combine all marinade ingredients and stir well. 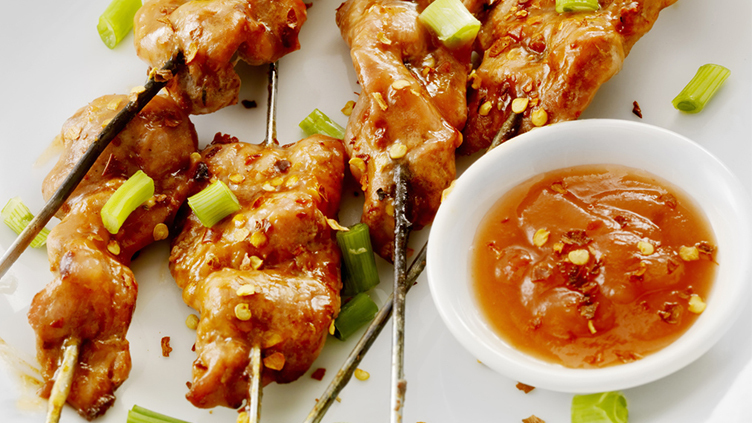 Cut chicken breasts into 1-inch cubes and add them to the marinade, stirring to coat. Cover and refrigerate for at least six hours. Thread chicken cubes onto the skewers, leaving room for handling. Place them in a single layer on a large baking sheet. Bake at 450 degrees for 10 minutes, flip the skewers, and then bake another five minutes or until cooked through. While waiting for the chicken to cook, add all sauce ingredients to a small saucepan. Whisk together for a few minutes over medium-low heat until smooth. Keep warm over low heat, stirring occasionally. Transfer chicken skewers to a serving plate. Brush peanut sauce over the chicken. Top with sliced scallions. Serve while warm. Miss your spaghetti and meatballs? 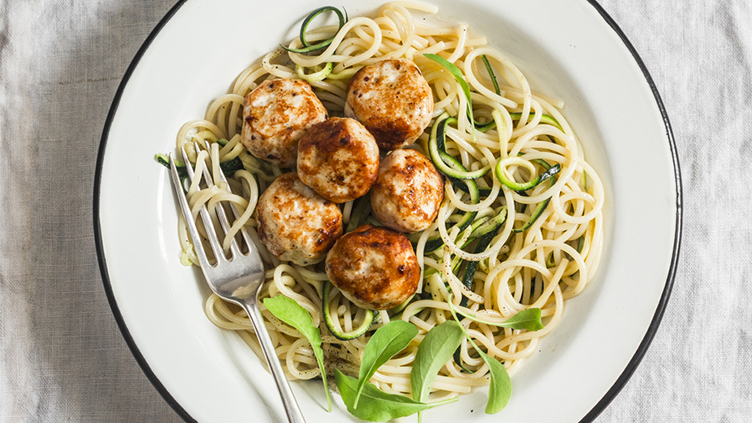 These delicious meatballs served over zucchini noodles will give you the taste you’ve been missing — without the extra calories and carbohydrates. Preheat oven to 350 degrees. Add the ground turkey, chopped onion, egg, cream, garlic powder, basil, and oregano to a mixing bowl and mix well to combine. Separate the meatball mixture into 12 portions and form each piece into a small ball. Place a piece of cheese in the center of each meatball and carefully fold the edges up around the cheese to seal it in. Spray a 13x9 baking dish with nonstick cooking spray and place the meatballs in the dish at least one inch apart. Bake for 15-20 minutes. Meanwhile, peel or spiralize the zucchini to make long noodles. Place the noodles in a saucepan with olive oil and sauté over medium heat until tender (about four to six minutes). Remove from heat and sprinkle with salt and pepper to taste. Remove meatballs from the oven and place meatballs over a bed of zoodles. Spoon the marinara evenly over each meatball. Sprinkle with parsley and parmesan cheese just before serving. This low-carb casserole uses ground beef for the crust. The result is a tasty Italian dish that is also gluten-free. Sprinkle cut eggplant with salt and let sit in a colander for about 30 minutes. Rinse and then fry in pan with nonstick cooking spray until browned. Combine ground beef, salt, pepper, Worcestershire sauce, and mustard. Press on bottom and sides of a nine-inch pie plate. Top meat with cooked eggplant. 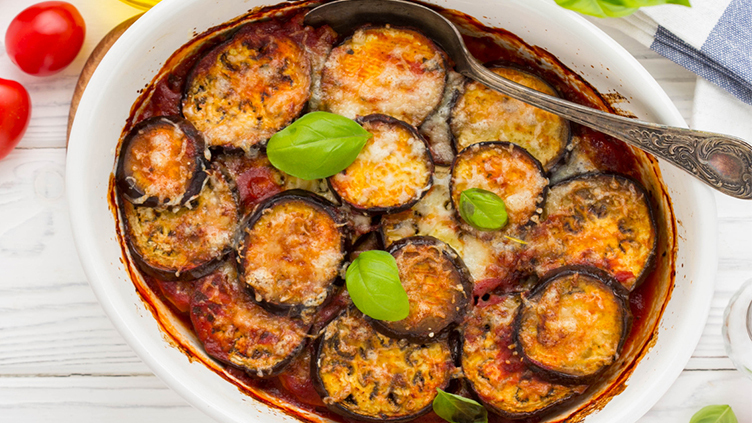 Spread tomatoes and sauce over eggplant and sprinkle with remaining ingredients. Bake at 375 degrees for 30-40 minutes. This recipe uses lettuce instead of tortillas to create a flavorful, low-carb dish. Peel and devein shrimp. Wash lettuce and shake off excess water. Wrap in foil and place in refrigerator to keep crisp. Mix together all Cajun seasoning ingredients in small bowl. Season shrimp and mushrooms with seasoning and let sit for 15 minutes. Mix together ingredients for Cajun mayonnaise and set aside. Spray skillet pan with non-stick cooking spray and sauté onions for one minute. Add shrimp and cook over medium heat for one to two minutes on each side until pink. Set aside. Using the same skillet, brown mushrooms. Add celery and bell peppers and sauté for two to three minutes. Add shrimp to pan and warm for 30 seconds. Remove pan from heat. 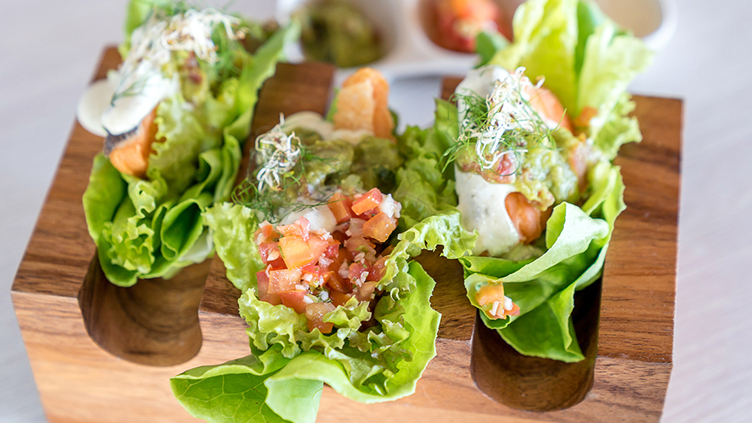 Arrange lettuce leaves on a platter. Spoon mushroom mixture onto each lettuce leaf and top with shrimp. Drizzle with Cajun dressing and add sliced cherry tomatoes. Wrap each lettuce leaf and serve warm. Can a Very Low Carb-Diet Control Type 1 Diabetes?